Aprilery is committed to create confident, elegant, distinctive style for women and girls around the world. We designs, creates, and markets high-quality fashion pieces such as rings, earrings, necklaces, bracelets, anklets and brooches & pins. We are engaging in responsible production, using environmentally friendly materials. From timeless daywear to the bold, glamorous, and fashionable pieces, Aprilery offers something for every need and taste. 30-day money-back guarantee for any reason; 18-month worry-free warranty for quality-related issues. We strive for customer service and the quality of our products. If you have any questions or concerns, please feel free to contact us at any time. 1. Keep it dry and avoid wearing it when bathing, doing housework and swimming. 2. Perfume is also corrosive to jewelry. Wear your perfume before putting on the piece. 3. Do not touch it often, grease and sweat on hands will caused corrosion. 4. Rub your Jewelry with baby wipes,they perform miracles on crystal jewelry without damaging the surface, then rub with a clean dry soft cotton cloth to bring back the shine. 5. Store your Jewelry inside a soft cloth pocket or fabric swath. Never stack it to avoid it from rubbing against other jewelry in your collection and try not to drop it on a hard surface. 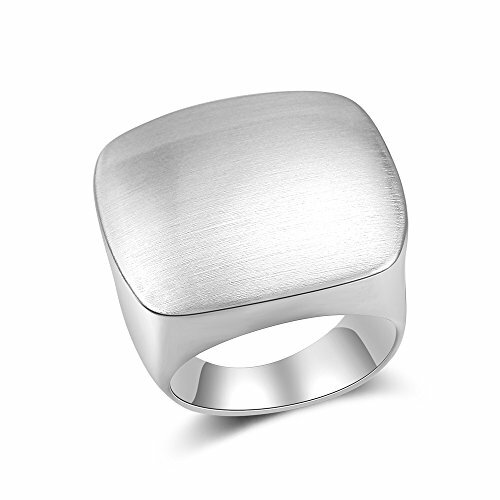 【NICE CRAFTSMANSHIP】The modern ring is made of copper alloy. Hypoallergenic, Lead-Free, Nickel-Free, comfit to fit. 【SUIT FOR OCCASIONS】The perfect accessory is great for dinners, birthdays, clubs, dances, weddings, graduations, parties, events, and daily life. 【THE IDEAL GIFTS】Whether you've known one another for years or your friendship or love is just budding, there's never a wrong time for a special gift. Every Aprilery pieces comes in a fine gift box. No wrapping needed. Perfect gift for Valentine's Day, Mother's Day, Thanksgiving Day, Christmas, Birthday, Anniversary, etc. 【100% SATISFACTION】30-day money-back guarantee for any reason; 18-month worry-free warranty for quality-related issues. We strive for customer service and the quality of our products. If you have any questions or concerns, please feel free to contact us at any time. If you have any questions about this product by Aprilery, contact us by completing and submitting the form below. If you are looking for a specif part number, please include it with your message.